In days of yore, a hiking backpack was an enormous double-decker of a rucksack, with a robust mild steel frame and canvas pockets for tea flasks. These things weighed a tonne, so we should count ourselves lucky that new materials accomplish the same thing at a fraction of the heft: welcome, then, to the best hiking backpacks for the modern adventurer. The biggest trick in picking the best hiking backpack is to pick the smallest. Not the smallest available, but the smallest you can get away with. It’s an old trope, but the bigger the sac, the more stuff you take. The Haglofs Lim Strive is an excellent 50L size that’ll force you to pack carefully, but will hold enough for pretty much any outdoor endeavour apart from full-expedition load carrying. It’s also very light, which is a massive plus. 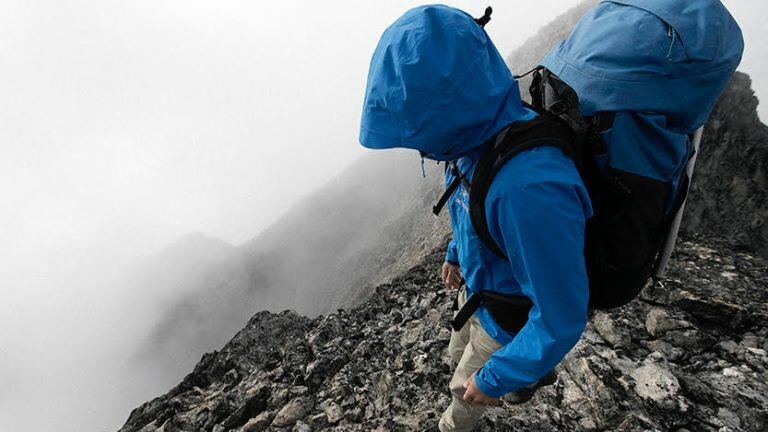 Hiking is all things to all people, so getting the right balance between weight, size and robustness is key, especially for something you’ll be wearing on your back for many days in total. Volume – arguably the most important starting point. How much do you really need to carry? Summer rambling along the coast requires a different set of kit to winter wild camping, but don’t get carried away and buy a giant windsock of a thing that needs an SAS team to carry once filled. Comfort – check and check again that your ideal sac fits your back well. Most makes have different back sizes available, so try a few on with both a light load and a heavy one (most shops have weight bags for this). Walk around and move naturally to see if anything rubs or feels weird. By all means try the super-techno suspended mesh solutions to getting a sweaty back, but rest assured after a long day with a heavy rucksack, your back will be sweaty, so don’t prioritise them over a really good fit. Weight – lighter is nearly always better, and that often means the minimum of random bells and whistles, which all add weight. Don’t be afraid to cut off straps and fastenings you know you’ll never use. Which materials perform the best? Modern hiking backpacks are made from whatever fabric you desire, from dyneema and kevlar to canvas and steel. Just remember there is usually a compromise somewhere in materials, but also that simple, tried and tested is unlikely to go wrong on you, whereas that interesting new kevlar weave might delaminate in strong sunlight. Although DWR coatings are helpful to avoid fabric wetting out and adding weight, covers and special ‘waterproof’ closures tend to not work in actual outdoor weather, so are best ignored. Remember, the real ultralight hiking backpacks on the market will wear out pretty fast, so it’s probably wise to pick a slightly more robust model with durable materials. But, again, your planned use is the key to choosing the right blend of weight vs durability. Very much in the alpine style of a hiking backpack, the Haglofs LIM Strive combines a lightweight design with clean lines and good load management. There’s even a nod to convenience with side pockets and pockets on the hipbelt. It’s also hydration system compatible. Particularly helpful is the ability to remove the frame and lid to strip weight right down (stock weight is a highly reasonable 1.14kg), while axe/pole attachments are simple loops and drawcords, which are easy to operate with gloves. The full length zip enables easy and fast access to that vital outdoors gadget that’s fallen to the bottom of the otherwise top-loading bag. At a total volume of 50 litres, this is big enough for most multi-day hikes. The Arcteryx Bora rucksack has seen a few iterations, and if you spend any time outside you’ll see a few go by. This is because it is comfortable to wear—that massive hipbelt takes the strain of even big loads, and at 50 litres this multi-day bag can handle whatever you want to throw at it. Multiple lid pockets help keep stuff organised (daytime items and snacks on the outside, car keys and head torch on the inside, for example), as well as an easy -access full-length zip leave very little else to be desired. Ok so the weight is a little chunky at 2.18kg, but it’s nothing to get upset about. Ultimately, this close second in our best hiking backpacks buyer’s guide will last you years. Built for the wilderness and with an RRP of around £240 this is a rucksack for serious hikers. If the details matter to you, Osprey has thought of every single one. The backpack has been moulded to the female form, and the clever strap system has been designed to support and distribute the weight of the load. It offers external hydration access, a sleeping bag base compartment and plenty of outside pockets. For the size, this rucksack is also very lightweight, making it a clear favourite, so long as you can justify the price tag. Vango has great history in the hiking backpack line, yet the brand has smartly moved with the times and updated their range with this solid little number. At 45 litres the F10 HUT 45 is on the smaller end of the best hiking backpacks, but it’s perfectly usable for hiking weekends away— the major benefit being you won't be tempted to take that extra jumper or spare camp stove. Indeed, at a reasonable total weight of 1.84kg you’ve really got it all here, with full zip access, daisy chain, hydration compatibility, side pockets, axe/pole attachments, and even a rain cover that you could leave at home to save weight during the dry season. Overall, Vango’s offering is a decent hiking backpack available for a solid price, and is one that’ll serve you well for many years. The Mammut Lithium packs in all the features you could possibly want, as well as a few new ones, but without breaking your back or your wallet. Weighing in at a mere 1.7kg, the Lithium sports daisy chains, loops for a mat, three side and front pockets, and axe and pole attachments. It’s also hydration system compatible and incorporates a raincover. The back length is easily adjustable, which is helpful if you’re wearing bulkier clothes in the winter, or if you’re sharing one heavy rucksack between a mixed party to make faster progress. There’s plenty of space here for days worth of stuff, and with a separately accessible bottom compartment you have a fighting chance of being able to find things easily. Berghaus are pretty reliable when it comes to outdoor gear and they haven’t gone wrong with this hiking backpack either. There’s plenty of space to store your items, plus compartments for water bottles, snacks and maps. You can expand the side pockets out to give yourself an additional 10L of capacity, while the adjustable BIOFIT back system helps to ensure the backpack is comfortable to wear, no matter your size or shape. If rain makes an unwelcome appearance, there’s also a foldaway cover that you can take out when required. If you’re purely trekking, this waterproof hiking backpack could be the perfect choice. It’s a reasonable 30L, which is enough room to store food, drink, first aid kits, camera equipment and anything else you may consider bringing along. Best of all, if you happen to get caught in a rainstorm (more than likely if you’re hiking in the UK! ), users mention that the watertight shell is very effective, keeping belongings bone dry in whatever weather Blighty throws at you. If you’ve just come out of uni and you’re looking to go travelling, the likelihood is that you’re not going to have tonnes of cash to spare. Suitable for camping, travelling and festivals, this is a great value hiking backpack that will become your trusty sidekick whenever it’s time to explore the outdoors. It features an airflow back to keep things cool, a compartment for a hydration pack, and compression straps to ensure it remains comfortable as you stride. There’s also a rain cover if the heavens happen to open mid hike! Our top pick for the best hiking backpack is the Haglofs Lim Strive. It’s lightweight and offers enough space for a plethora of outdoors gear and supplies. Picking a comfortable hiking backpack goes beyond sizing and through to a comfy hipbelt and a relatively light weight. The Arcteryx Bora 50 is enormously comfortable and relatively light, without compromising on durability or features. If it fits you, you won’t regret owning one.